This was to be the 1 month-old VP of Marketing at 99.co’s final social media posting, as he was immediately exposed and fired within the same day. Sonny’s comments aren’t all that different from an average forum-goer’s back in 2000, but that was then, and Facebook is a totally different ball game. 2012 bore witness to Amy Cheong’s expletive-ridden comments about Malay weddings in void decks. We won’t show the comments here, but it’s important to know because how negatively people reacted to her set the precedent for what happened to Sonny in this case. One look at Sonny’s responses and any normal person would get mad. Even if he was trolling, Sonny chose the worst place to pull a fast one on Adelene. If this was an anonymous forum, Sonny might have definitely gotten away with it. 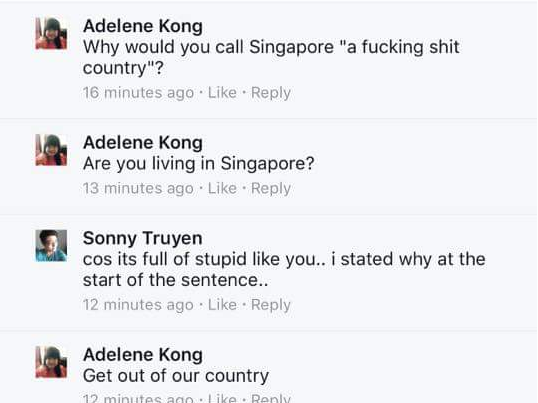 However, in this case, as Adelene points out, everything Sonny said had anti-Singaporean sentiments all over them. Two rules of viral content: It must be sharable, it must be easy to read. Sonny’s exchange with Adelene was not only easy to read, you just kept wanting to read more to see how it ended. There was only one way to go after the forum post was up on the Hardwarezone forums. On Facebook, your online identity is as good as what you actually think and say in person, so write with the idea that, if your boss reads it, he’ll be able to laugh it off at least. 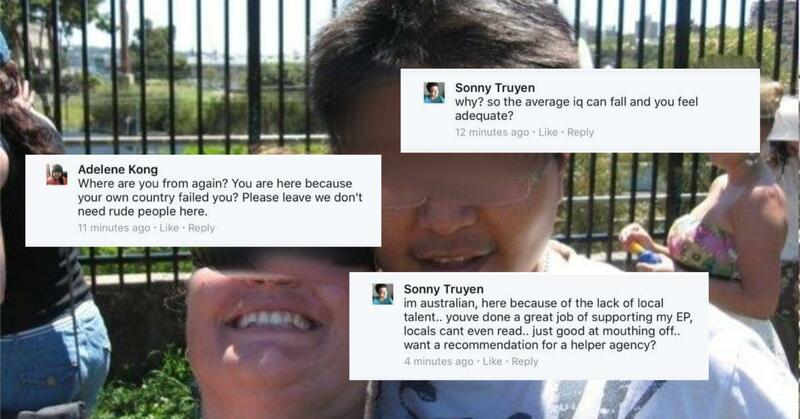 As a SEO specialist, Sonny should have known what the big FTs vs Singaporeans issues were. Over the years, there have been posts on Facebook about expats boasting about their superiority over Singaporeans, and none of them have ended well. Towards the end of the exchange with Adelene, Sonny probably felt he had the intellectual high ground. 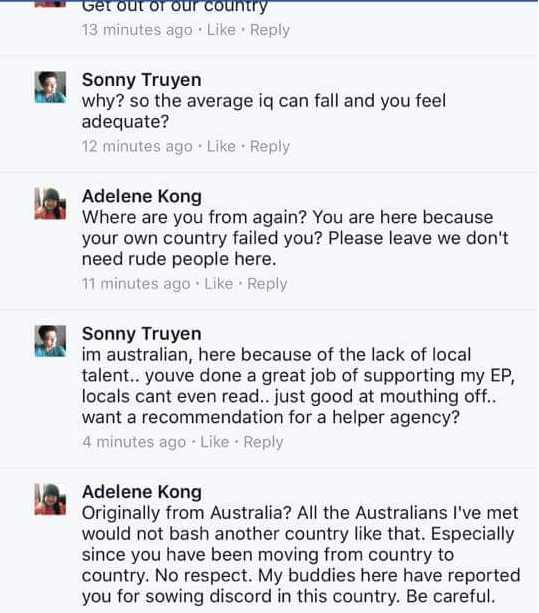 Personally, I pity Adelene for having to interact with such an arrogant person. Sonny’s final comment was supposed to be a mic drop, but all he did, really, was drop the hammer. On his own head. Adelene, like all Singaporeans, had the most powerful weapon in her pocket, the Hardwarezone forums. Even if Sonny eventually became a victim, he should have exercised much more restraint, especially against another person. If you’ve ever seen Hardwarezone forums do a CSI on anyone, you’ll know that there is no escape. For his troubles, Sonny Truyen was throughly CSI’ed, and people found out he was a high-flying marketing VP at 99.co. “It is within our power as citizens and residents of Singapore, to nip this at the bud and reverse the trend. Calling people to act tactfully against haters online isn’t going to change much, but the sentiment can be appreciated. Back to Sonny: however you act is however you’re going to be treated online, so, with your face on the line, act like how you would normally to others offline.